March has seen a ton of cloud computing activity. Recently Amazon Web Services(AWS) had nearly four hours of downtime with its S3 service, impacting nearly everyone on the internet, and Google wrapped up its annual cloud conference at the beginning of the month. If, like me, you attended Google Cloud Next 17, you’ll know that the entire conference was branded like a grown-up kid’s playground. Even with that in mind, you’ll probably be surprised that all of this activity has me thinking of LEGO bricks. Let me explain. If you were impacted by the AWS S3 outage recently you may be exploring other cloud platforms, or exploring multi-cloud options. If you’re not in the cloud already, you may be starting migration planning with a new cloud migration strategy. Recent events may have you going through a cloud platform selection exercise. It won’t take long to discover that three of the largest vendors out there are Amazon Web Services, Microsoft Azure and Google Cloud. If I asked you what your main concerns are with selecting a cloud platform, you’ll likely offer up many of the common cloud drivers: Pricing, security, reliability, services and capabilities, and availability of development and support services. These are all important, but if you’re really just starting with your planning – let’s talk LEGO bricks. Interested in learning more about your cloud readiness? I’ve rarely run into anyone that doesn’t know about LEGO bricks. Many of us think back fondly to thing things we built with these bricks in our childhood. Those memories make for a great metaphor when applied to cloud computing. 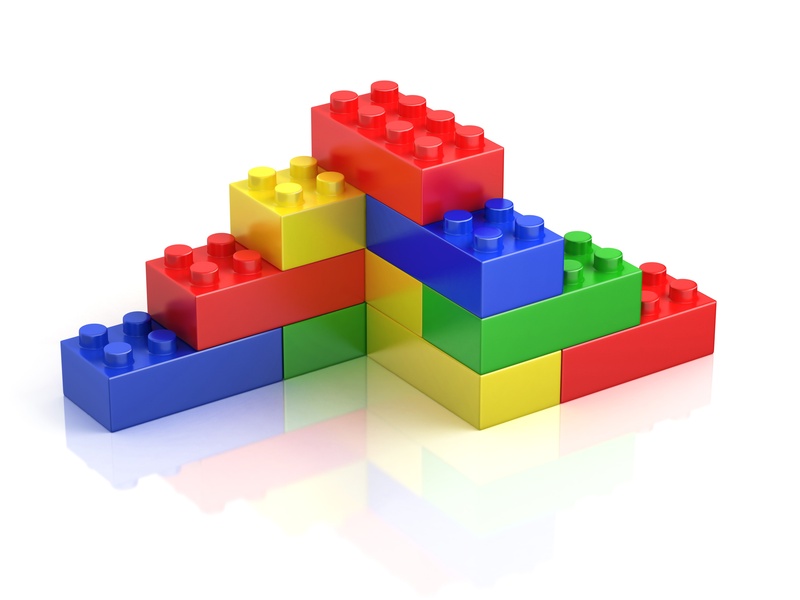 All of the cloud vendors have taken IT needs and created their particular set of building blocks. It’s up to your organization’s creativity to do what you will with those building blocks. You can build almost anything that you can dream of out of those bricks. I’m going to take the metaphor just a little bit further (before it falls apart), and categorize AWS, Azure and Google Cloud. In nearly all metrics, Amazon Web Services is undeniably the industry leader in cloud computing. More companies, including enterprises, use AWS than any other service. AWS is the LEGO company of building blocks. They have the widest variety of building blocks that you need, and are adding new blocks weekly, it seems. If you want to build something, you can assume that, if you choose AWS, you will have all the pieces you need. Imagine dumping out that box of bricks – starting with one brick, then 10, then 100 – to build what you want. This is a benefit, and also a challenge, to AWS selection. The benefit is that just like LEGO bricks, you can build anything. The challenge is that you need to have a vision to get beyond the simplest of structures; or you’ll need to spend a lot of time with those bricks, to get more sophisticated. In development of cloud building blocks, Google Cloud is the furthest behind by far; however they are closing the gap in services quickly. They are busy capitalizing on their experience of having used cloud computing in their company for years. They are focusing on transforming the internal tools they’ve created into products (with supporting cloud services), for public consumption. In the world of LEGO bricks, these are the kits that let you build specific experiences. Perhaps you don’t want to build everything from scratch. Maybe you’re a Star Wars® fan and you want a LEGO bricks kit that matches your company. With a kit, you do not have access to all of the bricks in a generic bucket of building blocks. However, if your cloud need matches one of the kits, you can take off running with a Millennium Falcon of cloud products. If you’re a big enough company Google will even work with you to create a new kit. A Workstate architect pointed out that Google’s Machine Learning capabilities, like Big Query, are extremely good, and their Cloud Spanner is the only full-scale, managed, cross-region RDMS on the market. Kits like these are powerful, and can speed your adoption of cloud. Finally, we have Microsoft Azure. Microsoft is AWS’ closest competitor in terms of services and capabilities. Microsoft, in the building blocks metaphor, is that company that makes blocks that are almost LEGO bricks. Let’s call them “Microgos.” Microgos are nearly as good as the name-brand AWS, but they simply don’t have the adoption of LEGO bricks – yet. However, if you’re not into name-brand, and you want that azure-colored brick that you won’t find with LEGO bricks, or if you like how the blocks fit in with your other toys, then Azure is a good way to go. That’s about as far as I build up this comparison of AWS vs. Azure vs. Google. I hope this gives you a slightly different perspective on cloud platform vendors. If I didn’t succeed in doing that, I hope I at least walked you down memory lane, and helped you recall all of those super-cool things you created with your building blocks growing up. Want to learn more about cloud computing building blocks?